AD Sizes Available 720×90 Leaderboard, 300×250 Medium Rectangle, Half Page 300×600, Responsive ad are responsive. GIF/JPEG backup: Rich media creative requires a GIF/JPEG backup for users who do not have the Macromedia Flash plug-in. Fractional ads must include a clear border to delineate between editorial and advertising content. If a border is not included, we reserve the right to create one. Fractional ads will not bleed. Advertising materials must arrive no later than 4 pm on Thursday prior to the publication date. If you require assistance in building an ad, elements and copy should arrive no later than 4 pm on Wednesday prior to the publication date. All ads must be submitted via wetransfer.com or Dropbox to Solismagazine#gmail.com. No FTP or email ads will be accepted. 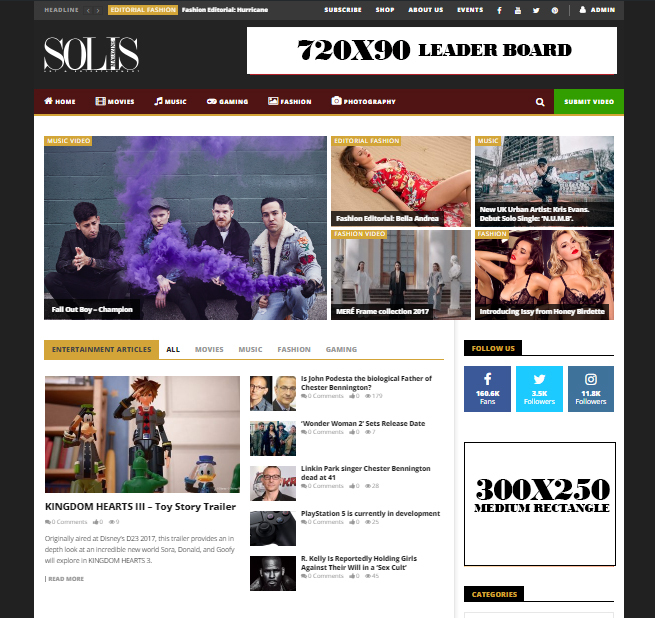 Solis Magazine will provide limited design assistance free of charge. Production adjustments to print-ready ads may result in a 15% surcharge. Solis Magazine is not liable for ads not approved by an advertiser by 2 pm the Friday prior to the publication date.